Daniel Murphy brother of Catherine Nash (nee Murphy) wife of James Nash. The Funeral of Daniel Murphy will move from the residence of his sister, Mrs Nash Monkland Street, this day, Wednesday at 12 o’clock. A fatal accident happened at the Monkland, the victim being Mr Daniel Murphy, Manager of the great Eastern Mine. No one witnessed the accident. It was assumed that he fell from the brace onto the surface, a height of some 20 feet. The whim boy had been sent by Daniel to the One Mile mine and in the interval the accident had occurred. Doctors Ryan and Benson were sent for to no avail. 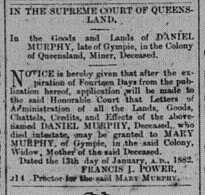 Gympie Times, 14th of January 1882. A magisterial enquiry touching on the death of Daniel Murphy, held by the police magistrate findings: Dr Ryan proved that the death resulted from a rupture of the blood vessels to the lungs. He could detect no injury sufficient to cause a rupture of the blood vessel or to indicate that he had fallen from any great height. During the past month or two deceased had complained to me of not feeling well. It was Dr Ryan’s impression that the rupture had taken place in the place where he, Daniel, was found. The deceased was buried on Wednesday afternoon and the esteem in which he was generally held was evidenced by the large body of mourners who followed his remains to the cemetery. The hearse was preceded by the band of the Hibernian Catholic Benefit Society playing the dead march of Saul.